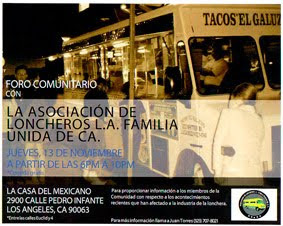 At the corner of Laurel canyon and Vanowen st in North Hollywood parks Tacos Texcoco. Texcoco is a municipality located in the valley of Mexico east of Mexico City. Lake Texcoco was originally one of the five lakes contained in the Valley of Mexico. The mural on this wagon is interesting. In the background is Lake Texcoco and the Valley of Mexico. The woman looks a bit overwhelmed. But what is the man holding? The front of the wagon had no list of meats or prices so when the taquero looked at me as if to say que quieres? I responded with "pastor y asada..one of each" hoping that I hadn't stumbled on a truck that served only borrego or barbacoa. I was afraid he would respond with "esto es un lonchera barbacoa! baboso! Mira el gabacho....ello dice "dame carne asada hahaha!" but my fears were quelled when the taquero smiled and said "$1.60 my friend" . I pushed two dollars through the window of the taco wagon and made note of the excellent deal "You could have really embarrassed me my friend, keep the change." My tacos came garnished with onions, cilantro and a spicy salsa verde to which I added some roja from one of the salsa containers. The sweetness from the salsa verde blending with the rustic dark red chile flavor of the salsa roja gave a slight piquant flavor followed by a spicy heat that stings the tongue and lingers. Overall these were excellent tacos. 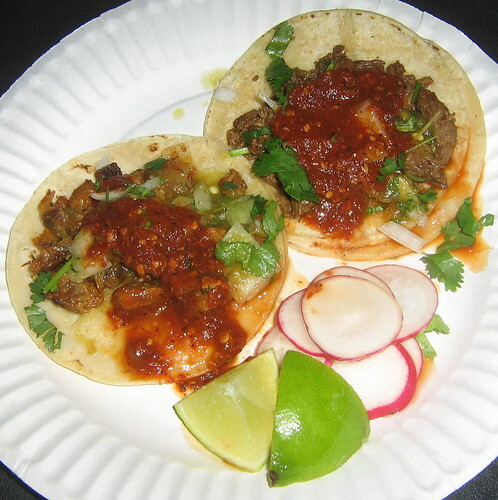 The tortillas soft and oiled, the meat juicy and flavorful and the chile salsas adding that extra punch. One thing these hombres need though is to advertise the 80 cent taco price and to put a menu on their truck. 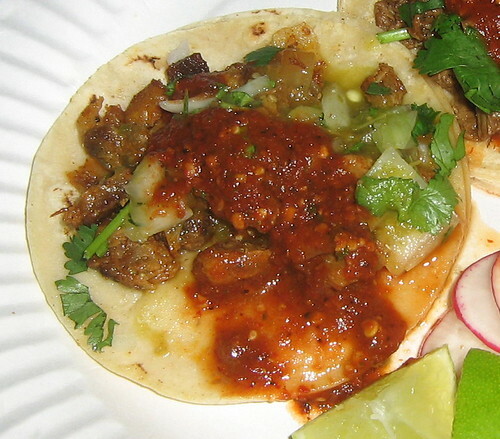 Most gabachos are intimidated by taco trucks that don't have the words carne asada on them. So now the dilemma. Go to Tacos Texcoco for the 80-cent tacos or go a few blocks east to Tacos La Fonda for those amazing homemade tortillas. Tough decision. Any advice, Bandini? OK, about the mural on the truck: It's actually a depiction from "La Leyenda de los Volcanes" (The Legend of the Volcanoes). Overlooking the Valley of Mexico (where Mexico City is nestled) are Popocatepetl and Iztaccihuatl, two majestic volcanoes crowned with snow almost year-round (you can actually see them on the background of the mural). The legend says that an Aztec warrior went away to war, but his wife pleaded him not to leave her. He told her to sleep until his return so she wouldn't miss him so much. So she did. But he was away for so long, she never woke up, even after his return. Overwhelmed by grief and moved upon noticing she had waited for him, he decided to wait for her to wake up, no matter how long. So he kneeled next to her sleeping wife, and they were gradually covered by the dirt, ashes and snow until they became the two volcanoes. Popocatepetl is supposed to be the male, and it has a small protruding peak on one of its sides that resembles a figure resting on bended knee. Iztaccihuatl is actually known as "La Mujer Dormida" (The Sleeping Woman), because of its distinctive silhouette. Anyway, that's what I remember from History class. You get 10 credits for reading this post. thats some great info mr bad example! thanks! 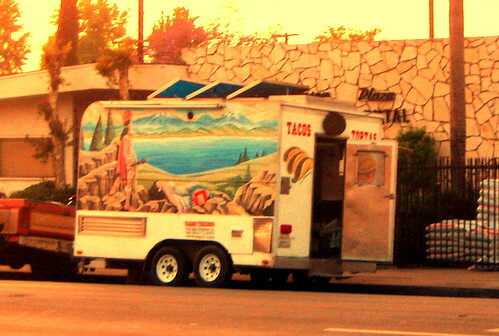 the legend of the volcanoes is a common theme with taco truck murals. tacos jeesy's has a nicely done mural of the legend of volcanoes. Just went last night and the tacos are now $1 a piece. Still a good deal for how tasty these little guys were. Unfortunately they were out of Asada when I went so me and my girl got 4 tacos Al Pastor a piece and sat on the curb to enjoy them with a mexican coke. The Pastor was flavorful and delicious but mine was extremely oily -- so much so that the two paper plates absorbed enough oil to leave the hand resting underneath the plates streaked with orange grease. Nevertheless it was one of my favorite Tacos Al Pastor in a long time. Thanks for the tip Bandini! Went to Tacos Texcoco last night and they had a 70 cent taco special. Until the awful construction moved into our neighborhood and now this truck has disappeared! Anyone know where it went? went by there the other night. yup the construction and no Tacos Texcoco. this is why even traditional loncheras need to use social media like twitter. Now they're gone from Laurel Canyon and Hart and some catering truck is there instead. Anyone know what happened? this is why even traditional taco trucks like Tacos Texcoco should be on twitter.